Episode 76 - I present my wild theories and hypotheses about the Mahabharata. Among other things, we discuss its relationship to the Precession of the Equinoxes and the Yuga cycle as defined by Markandeya and Sri Yukteshvar. We look into the role of magic in the story and our prospects for regaining this lost knowledge in the future. We delve into the mystery of the metaphysical origins of the Pandavas and consider whether the five brothers might have originally been based on just a single hero-- the proto-Arjun. caste not hereditary is something very well known in Indian literature. For example author Ramayana the great rishi Valimiki was a highwayman i.e. a robber. Similarly, Vishwamitra the great seer of vedas who authored, Gayathri Chhand and many more vedic verses was a former prince. One of the greatest vedic rishis called Jabali, whose ancestory is still claimed by many brahmins in India was born to a prostitute and his mother had no idea about who was the father of her child. I can go on and on, and you can look it up on the web, but didnt that strike you as to how Parashara(a brahmin) impregnantes a fisherwomen(Matasyagandha) who goes on to give birth to Vyasa(Brahmin)and the same vyasa impregnates ambe, ambalika who in turn were the forfathers of Pandavas(Kshatriyas)!!!! You know, I did think of that, but didn't really know what to do with it. The reason is that, at least in the Mahabharata, the caste exception seems to apply only to two situations-- First, Rishis do not seem to fit into the caste system at all. I've noticed that when dealing with the sages in the forest, there is no effort made to specify their caste. They are simply respected for being sages, and their caste background is never stated. Some examples would be Narada and Markandeya-- I can't think of any time in the epic where their caste is ever mentioned. This is also true of the strange guys like the saddhu whom Pandu kills while he is mating with a deer. The second exception I've noticed is when a Brahmin takes a Kshatriya wife. The caste of their sons is apparently optional. For instance, when Rama Jamadagnya kills the entire race of Kshatriyas, the caste is regenerated because the kshatriya women mated with Brahmins and their sons became Kshatriyas. Thus the same exception could be applied when the Kurus were in need of sons and Vyasa was brought in. My assumption was that, had the boys been raised by Vyasa, they would have been considered Brahmins, but since they were raised in the court, they were Kshatriyas. Those two cases seem like special exemptions from the more general rules of the caste system of that time. Karna for instance is given NO option of having his caste changed, and people who are born Brahmins like Drona & Krpa do not get to change their caste either (assuming that they'd want to, of course!). I know that I've been told by my teachers that the caste system was less rigid in the deep past, but so far the Mahabharata has NEVER said that, even when it is talking of events far in the past. The assumption in the epic seems to be that the caste system has always been hereditary, with a couple of special exceptions. Thanks for bringing in examples from other sources. 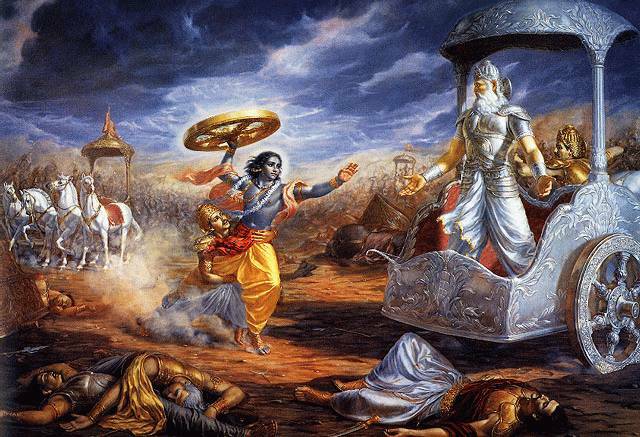 I must confess that at this point I am only deeply familiar with the Mahabharata, so it is hard to make general statements about all the other Puranas, Itihasa, & Vedanta. I'm considering doing an Upanishads podcast when this is done, because I really ought to get to know them better! I have a hypothesis that the five Indras and Pandavas are a literary device explaining the five solar years (husbands) that are married to the lunar cycle (wife) and these cycles are "married together" in one specific year (Arjuna) that yields a short lived son (remainder or leap months). The obvious marriage of observation, mathematics, literature, family and spirituality were all amazingly woven into an epic among epics, It is humbling to see the discipline not as described, but rather the intelligence to understand and convey this timeless message; on earth as it is in Heaven. My thanks to you Lawrence for the message broadcast. Blessings be on you. Count me as a follower of the Upanishads podcast if you elect to do it! In fact, I would love to hear you discuss more along these lines with the books you have and will study. I can see that its helpful to have the background of the Mahabharata in order to understand some of these other ancient cultural ideas. I do agree with the idea that energy/miracles/magic is increasing in the world. I myself practice a form of energy testing of the body, and energy healing. And I can see that it is necessary to have dharma (virtue)in place as a firm commitment for these modalities to be used for everyone's highest and best good. In thinking about Christian roots, the single man Arjun with the characteristics of the 5 brothers might represent Adam who had all those wonderful qualities, plus almost 1000 year lifespan. I think I am going to go back and listen to all the story again and fill in more details of what I am missing. Someone needs to make a Mahabharata coloring page to go along with each episode. I would love that.